With proper care and timing you can raise healthy vegetable, flower and herb plants indoors to plant outdoors from seed. In St. Louis lettuce and cole crops such as broccoli, cauliflower, or cabbage, should be started about February 15; tomatoes, peppers, and eggplant about March 15; and cucumbers, squash, and melons about April 15. Flower and herb seeds vary widely. Check the seed packet for when to plant. Be sure to use a new, soil-less seed starter mix available for this purpose to reduce the chances of your seedlings damping off. 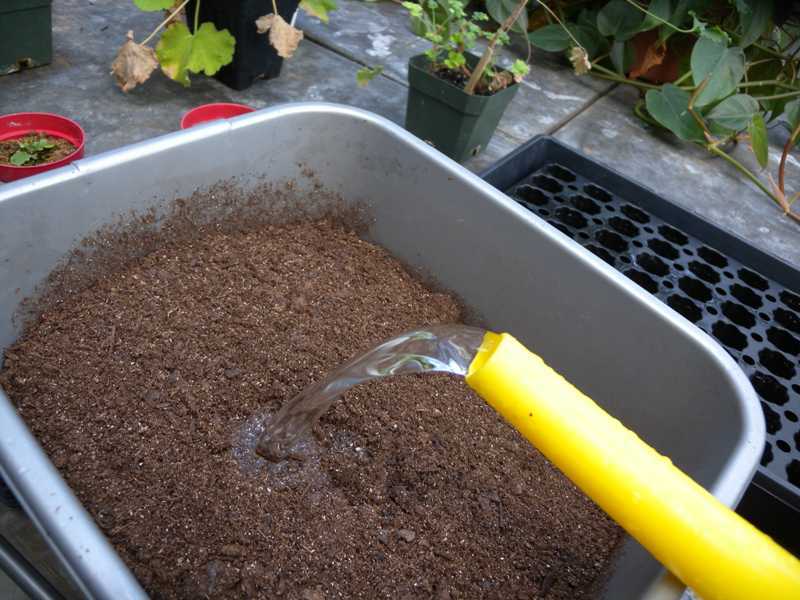 Add water to your seed starter mix so that it is saturated like a sponge but not soggy. Let it stand for a few minutes to absorb the water. Stir to make sure all the mix is uniformly moist. 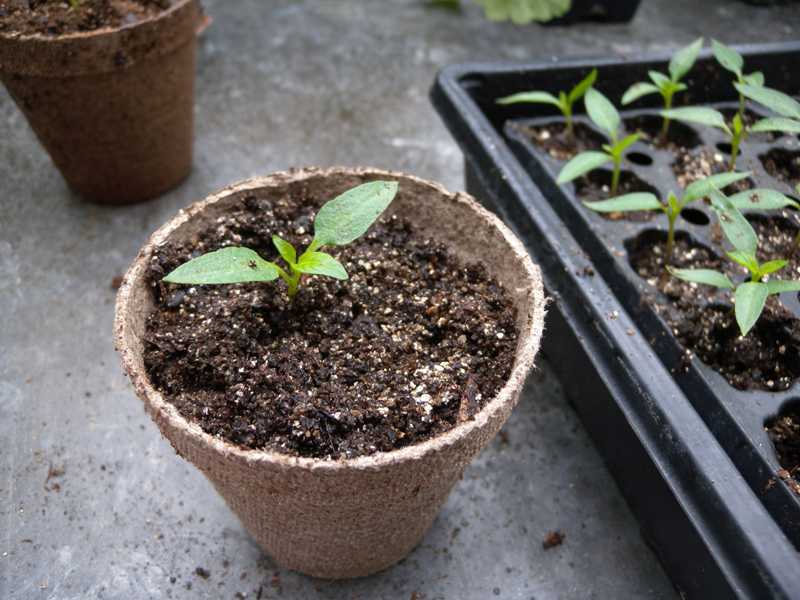 Seeds can be started in a variety of containers, but a convenient way is to purchase an inexpensive flat with plugs and a plastic cover which can be used for several years. Make sure that any container you use has drainage holes in the bottom. 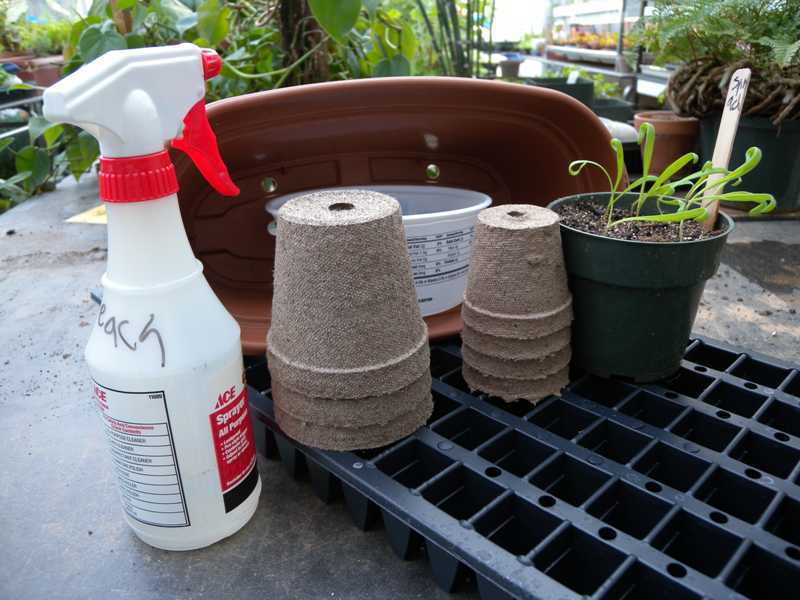 If reusing your tray, be sure to wash the tray with hot, soapy water and rinse with 10% bleach to water solution to prevent spread of diseases from last year's planting and then air dry the trays. Fill your tray with dampened mix. 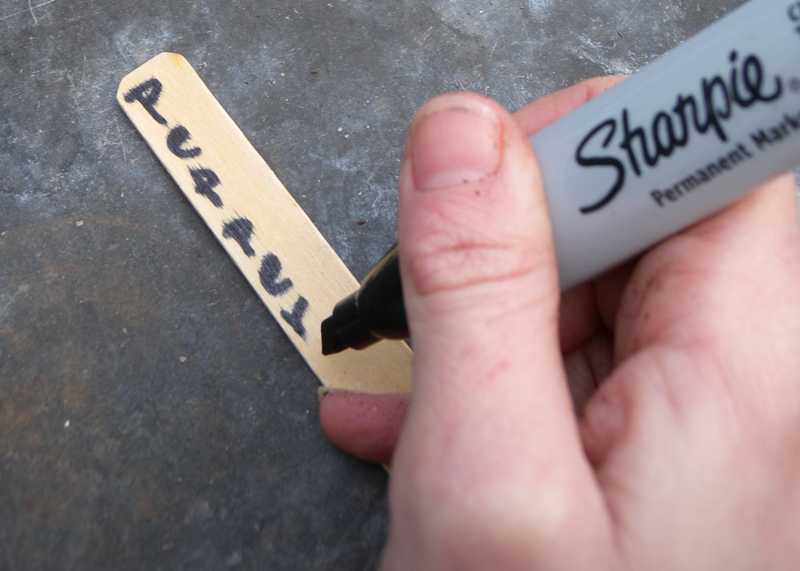 Label your plants including date planted, type of plant, and cultivar. 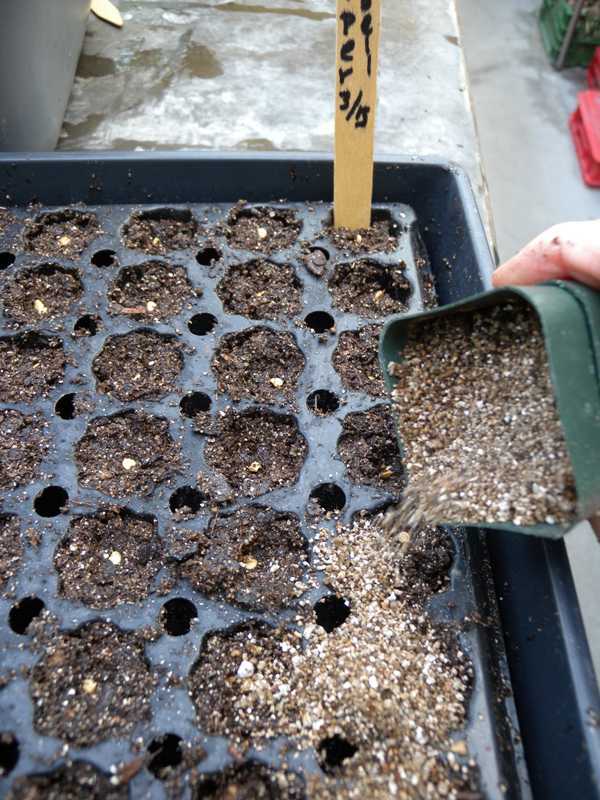 Cover the seeds with more seed starter mix or horticultural vermiculite. Since the mix is pre-moistened, no additional water should be necessary. If you did not pre-moisten the mix, soak the flat in a large dishpan or tray of water until water has wicked up to the top of the soil. This can take several minutes. 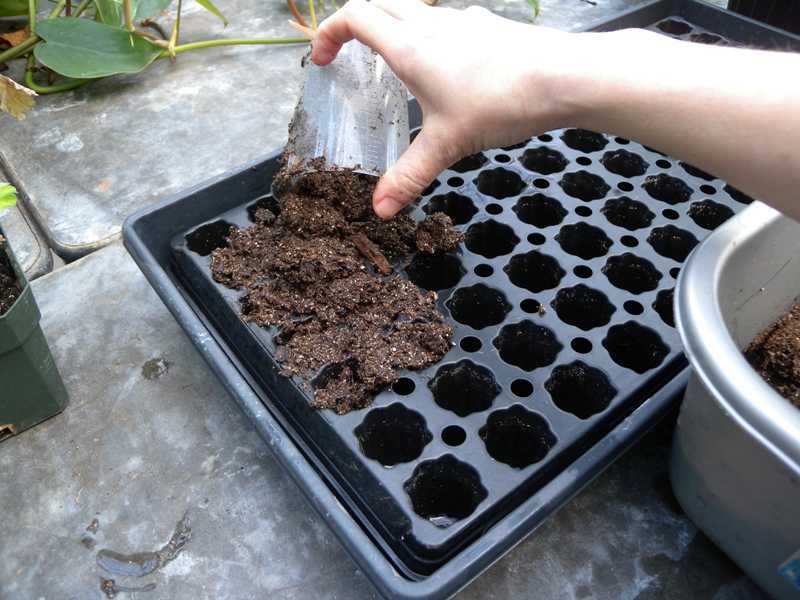 Then, remove the seed tray from the water and let drain. Rarely does a home gardener need a whole tray of one varietly so seeds can be combined if well labeled. 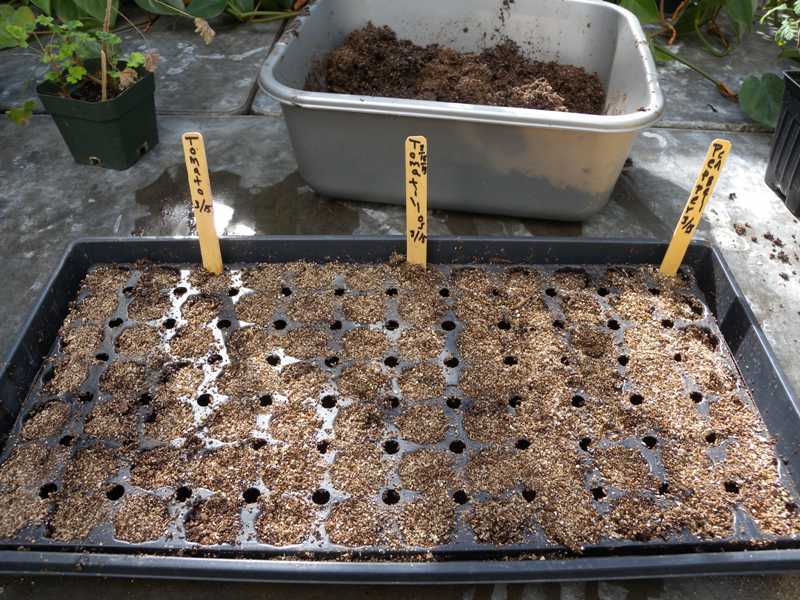 It is advisable to plant seeds that require about the same number of days to germinate in the same tray so they all germinate at the same time. 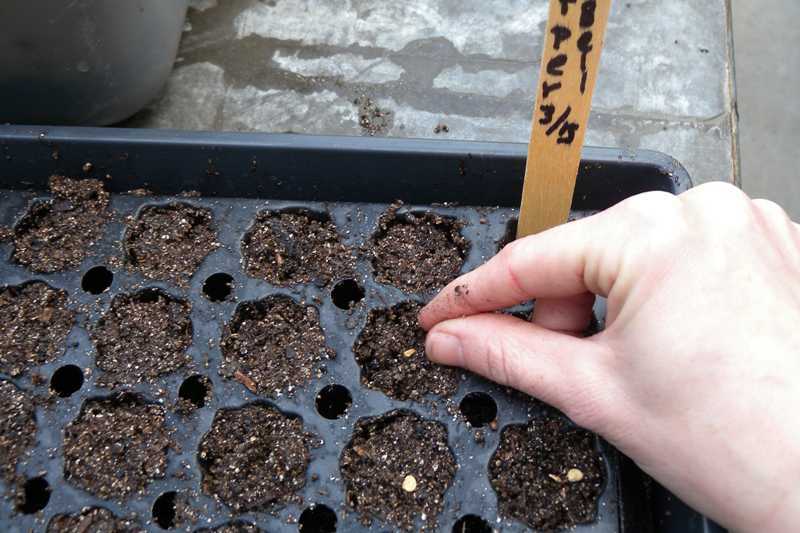 Alternatively, the tray could be cut in sections and each section removed as the seeds germinate. Cover your flat with a plastic cover or clear plastic to prevent drying out during germination. Place in a warm location about 75 degrees F, out of direct sunlight. 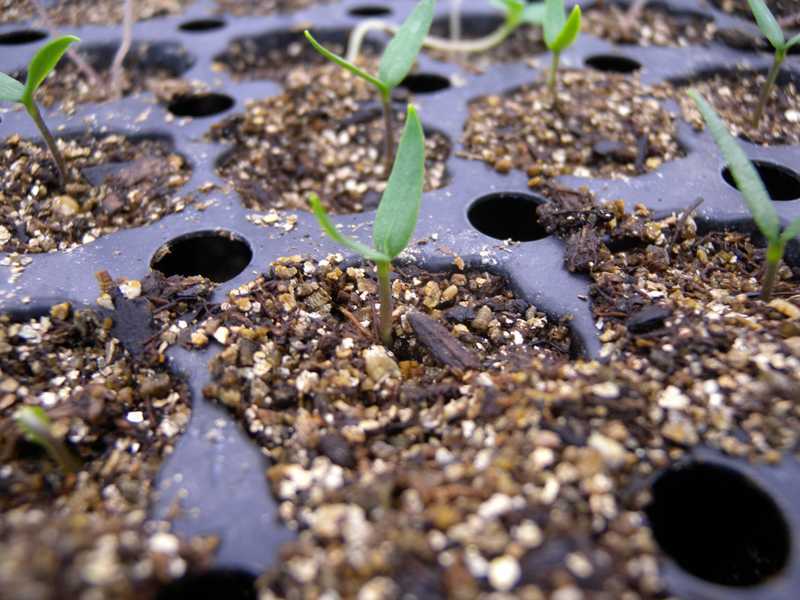 In this example, peppers took about 7 to 10 days to germinate. 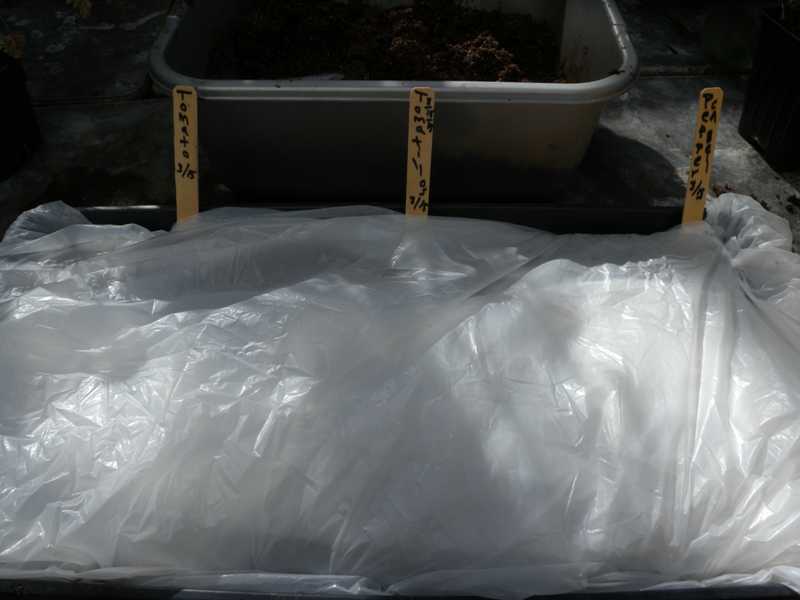 As soon as plants emerge, remove the plastic cover and move to a cooler location about 65-70 degrees in strong light. A South window sill is a good place but under grow lights is best. If using fluorescent lights, place plants 6-10 inches away from the bulb. Leave the light on for 12 to 18 hours and fertilize weekly. Water sparingly to keep plants from wilting. Do not overwater. These seeds germinated at different lengths of time: tomatoes (left and center), 3-4 days and peppers (right) 7-10 days. Cutting the seed tray apart and removing the tomatoes as soon as they germinated could have prevented the tomotoes from becoming leggy before the peppers germinated. When the second set of leaves appear, the seedlings can be thinned to one plant per cell if needed. 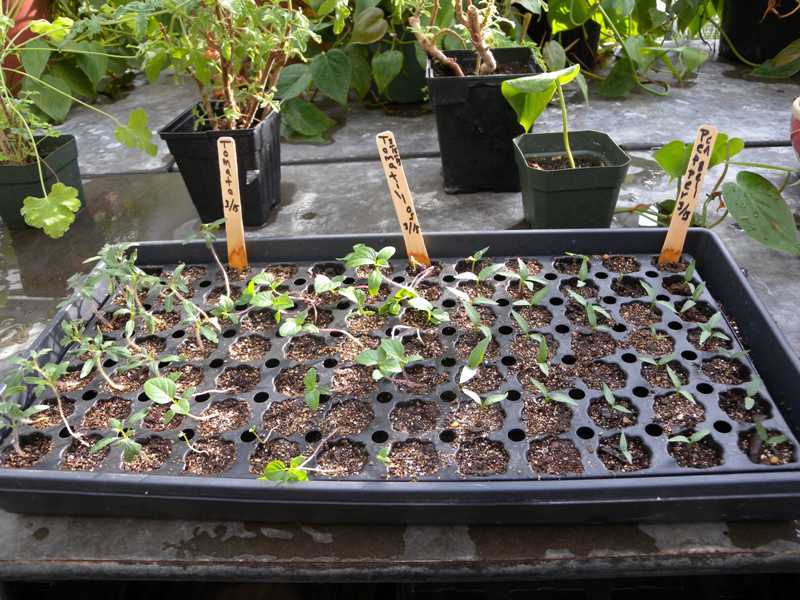 Depending upon the size of your tray, some plants can be kept this way until they are transplanted into the garden. In this case, these plants were started in a plug tray, which hold only a small amount of soil. They will need to be repotted into larger pots to give roots room to expand. 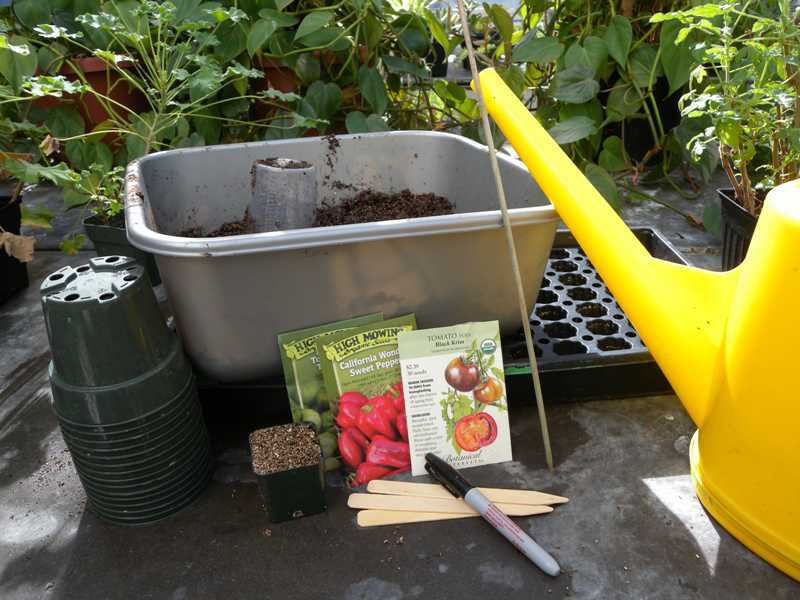 Seeds started directly in peat pots or cell packs may not need to be transplanted if they hold suffcient mix. Always harden off the plants by slowly exposing them to outside temperatures, wind, and light a few hours more each day before moving them to the garden. This usually requires a week to 10 days.